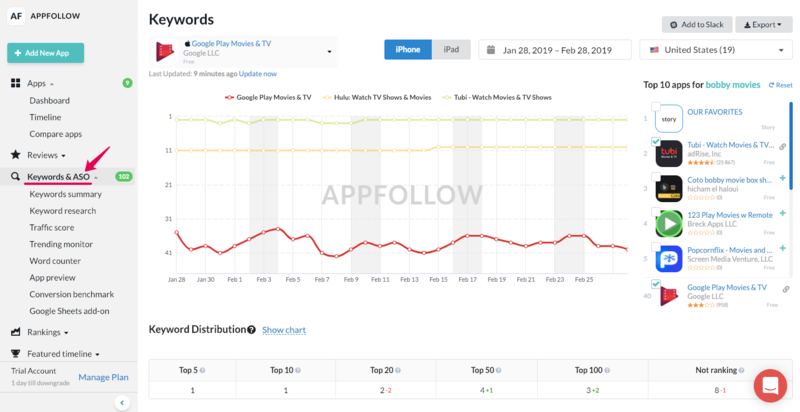 AppFollow provides you with the bunch of ASO tools that help you boost your ASO app store optimization and get many app downloads. Keywords & ASO (it is a drop down menu, and yes, you can click it) — Find how your keywords work, what traffic score and position they have. Keywords summary (iPhone, iPad) — Explore how good your competitors are in terms of your keywords. Keyword research — Track down the best matches of words and phrases your users use. Traffic score (iPhone, iPad) — Get 100% accurate keywords search volume. Trending monitor (iPhone, iPad) — Spot new trendy user requests. Word counter — Define the words that are visible in short description and check their positions. App Preview — Discover how your new graphic, text and video will look like on different devices. Conversion benchmark — Spot which categories run the app business and compare your results with the market. Google Sheets add-on — Use full-featured Google Sheets add-on for all the ASO Tools: discover new keywords, get traffic data and search results for every keyword.